To pass any exam you need to learn in the most efficient and effective way but only part of that is down to you the student, much is about the way in which you are taught. Little has changed in the way knowledge has been transferred over the years. Initially teaching was one person talking to a few people; let’s call this the Neanderthal approach, the first classroom? Then we had a major innovation the printing press, around 1450, which made it possible for knowledge to flow around the world, all be it slowly, no email in those days. But with the advent of the computer in 1837 (Charles Babbage) or 1942 (first digital computer) or the first PC, IBM 1953, the ability to store and transfer information to the masses was possible. Yet little changed in the way we were taught, until now. Now we have both online and classroom learning. But what is best way to learn, what is the most efficient and effective way to transfer knowledge? If you think of a traditional lecture, the lecturer stands at the front and talks, the student makes notes and then goes away to read and perhaps actually learn something about the subject. A mass of content is available online, you can watch the very best lecturers from all around the world, stopping and starting the presentation to suite the speed in which you learn. Or perhaps you have a sophisticated e learning course where activities are carefully constructed to explain what you need to know. But this can be lonely and despite the claim that online is the same as being in a classroom, from my experience it is not, it is different. But is the best method to have a blend of both online and Classroom / Lecture Theater. This is the idea behind the blended course. Attend the lecture and then watch some online instruction later in the day perhaps. However much thought needs to be given to how this works, directing students to random You Tube clips is far from ideal. Yet it feels like a move in the right direction. And now the Flip – The flipped classroom (2004 ish) takes its name from the idea that content has historically been taught in the day and students expected to apply that content in their own time for homework. But is making notes in class the best use of that face to face time? Should students not watch the lecture on the evening, benefiting from studying at their own pace and then attend class the next day, where they can ask questions? Can we flip the process? 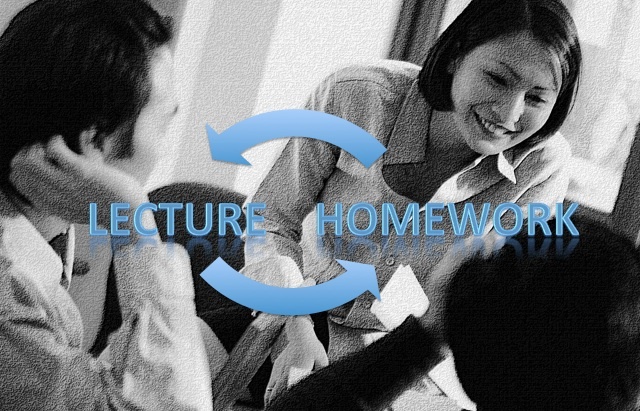 In class the lecturer or teacher can then bring the subject to life using real world examples, answer student questions and deal with individuals on a one to one basis. Okay it is far from perfect and it has yet to be proven over time. But it does seem to make a lot of sense and for the first time we may be seeing the power of the PC complementing rather than competing with the classroom. This entry was posted in Education, learning and tagged Charles Babbage, Classroom, Education, Examinations, Free content, Khan Academy, learning, Open content, Salman Khan, ted. Bookmark the permalink. ← What’s the point of exams – what do they prove?